OTONWES - Although not yet officially introduced, at the Geneva Motor Show 2015 exhibition, officially confirm the automaker Audi car prices Iron Man, the second generation R8. In its official statement on Wednesday (03/04/2015) Audi announced the price of second-generation R8 to the automotive market is priced 119 500 British pounds for the V10 engine primarily to 540 PS and 137,500 pounds, for the V10 engine with 610 PS. 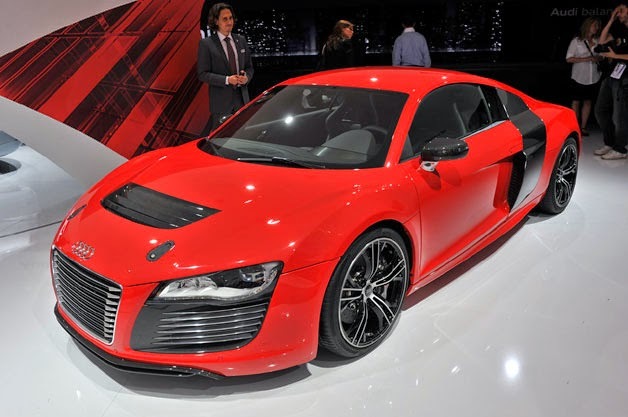 Consumers can order a new British supercar Audi in May and will be delivered to the garage start late 2015. German automotive manufacturer is not divulge the full specification R8 latest model, but it is already known that the second generation of cars Iron Man is holding a V10 engine with a different power the 540 PS and 610 PS. For the Audi R8 V10 plus accelerates from 0-62 mph in 3.2 seconds, and from 0-124 mph in 9.9 seconds. Multimaterial Audi Space Frame construction helps reduce weight by 50 kg. FSI V10 engine that was carrying it there are already direct injection and some are indirect. No Comment "Iron Man car, the Audi R8 Priced From USD 2.3 Billion"